The medieval parish church of Lochgoilhead enjoyed the patronage of no less than three saints, but we have no idea who they were, where or when they lived, nor why they were acknowledged as saints. But the records are clear. In 1392 the pope wrote a letter concerning ‘the parish church of the Three Holy Brethren de Kenlochgoyl in Lismore diocese’ (CPLS i, 175). Half a century later, when Duncan Campbell of Lochawe was establishing the church of Kilmun as a collegiate church with five chaplains serving there, he assigned ‘the fruits, rents and profits of the parish churches of St Conan of Dysart (Glenorchy) and the Three Holy Brethren of Kinlochgoyll‘ for their support, uniting those two churches to Kilmun. And the Church of the Three Holy Brethren was not without its troubles. In the same year the pope acknowledged that ‘the church of the Threee Holy Brethren of Kanlouchgoyl‘ was in ‘sparsely populated parts among men completely rough and uncharitable, and through constant wars, dearths and other sinister events it is completely collapsed in its structures, roofs and edifices, is destitute of ornaments, and books ….’. To help this struggling church he encouraged the faithful people to visit it and contribute to its welfare, and granted indulgences to ‘all and sundry faithful of both sexes who visit the church on the feast of the Three Holy Brethren and the eight days following, and give of their goods or stretch out a helping hand for its repair’ (CSSR iv no. 819). If the devotion to the Three Holy Brethren of Lochgoilhead is well established, their identity remains a mystery. They clearly had a special feastday when people visited the church, and if we could find out when that local celebration took place it might help us to identify who these three men were. But we don’t know when their feastday was. 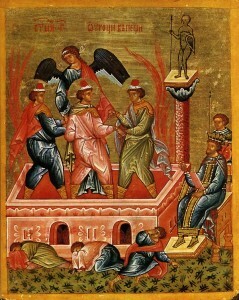 Two of the early martyrs of the Church, Cosmas and Damian, were brothers and physicians who suffered and died under Diocletian in the late third century. Their story includes the claim that when they were killed their three younger brothers were slain along with them: Anthimus, Leontius and Euprepius. But this is an extremely unlikely identification. Firstly, dedications to Cosmas and Damian are vanishingly rare in medieval Scotland; and secondly because it would seem absurd for a church to be dedicated to these very three obscure brothers without mention of Cosmas and Damian themselves. Another possibility is that the Three Holy Brethren were understood to be the three young men mentioned in chapter 3 the Book of Daniel, thrown into a fiery furnace by a wicked king and saved by God. 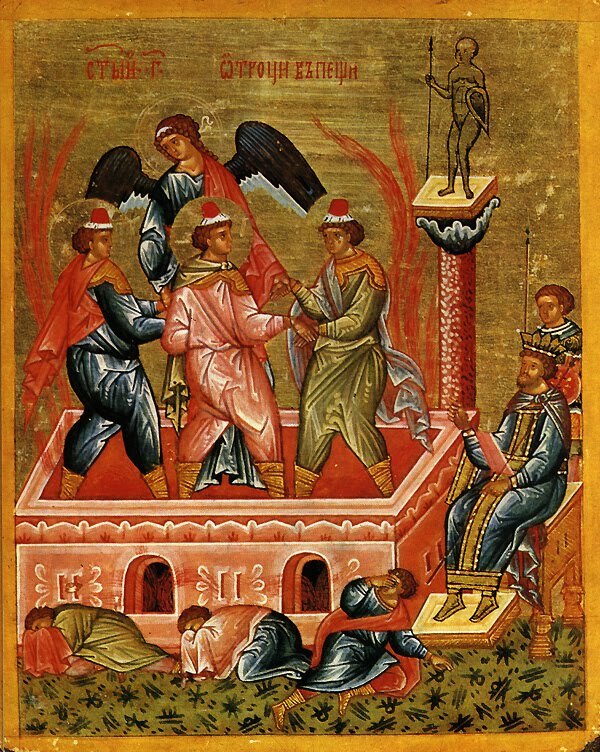 The song they sang while standing unharmed in the flames (the Benedicite) appears in the Greek version of Daniel but not the Hebrew. In its Latin translation it was very popular in the medieval Gaelic world, and sung regularly. Could these three – Ananias, Azarias and Misael – be the three Holy Brethren of Lochgoilhead? Again it doesn’t seem likely. First, there is no suggestion that the three youths in the Book of Daniel were brothers; secondly there is no evidence of these three being culted as saints in the West. It may be that the Three Holy Brethren of Lochgoilhead were local saints, Gaelic-speakers, part of the local community here, and not known to the wider church and therefore not recorded in calendars or missals. For the present, they remain an an enigma. That need not stop us honouring them, as people did in earlier centuries in Lochgoilhead. And the visitor should be reassured: the people of the area are not ‘completely rough and uncharitable’, nor are there ‘constant wars, dearths and other sinister events’. You will find a warm and friendly welcome. And you might even get the indulgence!